The main valves in the heart prevent blood flowing through the atria and ventricles, the chambers of the heart, in the wrong direction. If heart valves are damaged through infection, or they start to wear out later on in life, this can cause symptoms such as breathlessness, tiredness, palpitations, pain in the chest, and swelling of the tissues in your legs. When these symptoms begin, and a heart valve problem is diagnosed, the first step is to use drugs such as ACE inhibitors to help the heart work a little bit harder to counteract the effects of the faulty valves. If the problem becomes more serious, the only treatment may be to repair the heart valve surgically, or to replace it completely. Although some heart valve repair operations and even heart valve replacement surgery can be done using keyhole techniques, many heart valve operations need to be done by opening up the chest and performing open heart surgery. There are two main types of heart valve repair operation. If the opening through one of your heart valves has narrowed, it can be widened so that blood can pass through more easily. Sometimes, a heart valve becomes too flopping and leakage of blood in the wrong direction can occur. In this case, a special ring is inserted into the valve to strengthen it and to enable it to keep the correct shape as blood flows past it at high speed. This is particularly important for valves that control blood at the exit point from the ventricles of the heart as the force pushes blood out into either the main aorta or the pulmonary artery at high pressure and high speed. If the heart valve is too damaged for a repair to be possible, the whole valve is removed and a new one is put there in its place. When heart valve surgery was first developed, all replacement valves were made from animal tissue – usually pig heart valves. These work very well but pig valves are not human valves and the proteins within them are seen by the body as ‘foreign’. They set off an immune response, which damages the heart valve over time. Animal tissue is still used in some heart valve replacement operations, but the surgeon looking after you will explain that these may only last 8-10 years before they need replacing again. A more permanent solution is to use a completely artificial heart valve replacement. This is made from a special plastic polymer and is designed to be accepted by the body, and to stay in good condition for much longer. Generally, artificial heart valves last for the rest of your life – possibly 20 or 30 years. 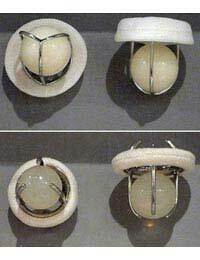 The disadvantage to artificial heart valves is that they make a small clicking sound when they open and close. This isn’t really audible to people around you but some people find that they can feel the clicking inside their chest. After a time, most people get used to this, just as we all get used to the feeling of our hearts beating. Heart valve replacement surgery is getting fairly routine now, but that doesn’t mean it is a minor operation. You will need to stay in hospital for about 10-14 days and the procedure, unless it is done with a keyhole technique, involves open heart surgery. You will be hooked up to a heart and lung machine, which will control your body’s circulation, and your heart will be stopped during the operation. The chest is opened up at the sternum, and the wound can be several centimetres long. After the operation, you will need to be intensive care for a few hours and then recover over the next few days, with painkillers as necessary. It is important that you start moving about the next day to avoid getting blood clots in your legs and the more mobile you can be, the better for your heart and your general recovery time. The wire that is used to fix the bones of your sternum back together is left in your body permanently and the other stitches dissolve over the next few weeks but you will need regular checkups in the weeks and months after the operation to make sure the heart valves are working correctly, and the operation has not caused any other heart problems. I had keyhole surgery performed on me to repair the mitral valve in 2010 this was in the Brisbane Queensland Prince Charles Hospital (The Holy Spirit North side). By a cardiologist Trevor Fayers Rheumatic heart Disease perhaps was probable the cause when I was young I was told. The operation did not go well for me, he thecardiologist nicked the aorta and after opening up the chest twice to repair the aorta, it was replaced my stay in hospital was about four weeks I don't smoke and I drink very moderately my medication is 7 to 8 mg of warfarin daily so be aware when the surgeons offer an alternative to the mainstream of surgery Trevor Fayer did come to my bed and apologized for what happened. @Col. That's the kind of thing you should discuss with your own medical consultant as he/she knows you best. I had OHS for a CABG four years ago and a St Judes pacemaker/defib device fittted three years ago. I now need to replace the aortic valve. Is there added danger by having two lots of OHS or should I look at other options for surgery? I had an open heart surgery in july 2011, when by 3rd baby was just 8 months old. N 3 of my kids were c-sec born. By Allah's grace I was back to normal in just 3 months time. I just did what my doc asked me to do after the surgery. Now I get tired soon, often feel short of breath n feels pain aswell but its ok I am able to do all the routine of a day. N I am happy al hamdu lillah.